Deliver at your own risk. Globally, road accidents kill more NGO staff per year than any other factor. Organizations often ignore vehicular maintenance, while also delaying responding to driver suggestions and requirements due to pressing business concerns. While an organization's reputation depends on their ability to complete their tasks in time, and in a safe manner, organizations often prioritize these concerns last, leading to high losses in fiscal resources as well as trained staff. These losses are completely avoidable if some caution is exercised internally. Driving Force! and Delivery Force! are two variations in a series of games about organizational transport safety developed for Fleet Forum, a Netherlands based organization that works with road and transport safety advocacy globally. Rose van Steijn from Fleet Forum and Global Spark collaborated with us as the content expert and organizational liaison for the project, and Driving Force! was part of her PhD Thesis project to showcase the relationship between interactive learning and information retention. While Driving Force! was developed purely for NGO's and other aid organizations, Delivery Force! is an adaptation of Driving Force! for commercial organizations. The core issue that both the games wanted to highlight was that the steady decline of vehicular safety within organizations costs them a lot more in the form of trained personnel, time, organizational reputation, and incremental financial losses incurred by these organizations due to road accidents, and over time, these losses cost the organization a lot more than regular upkeep of their transportation fleet. Driving Force! is a competitive co-operative game played by 8-10 players per set. Multiple games can be played to accommodate additional players. 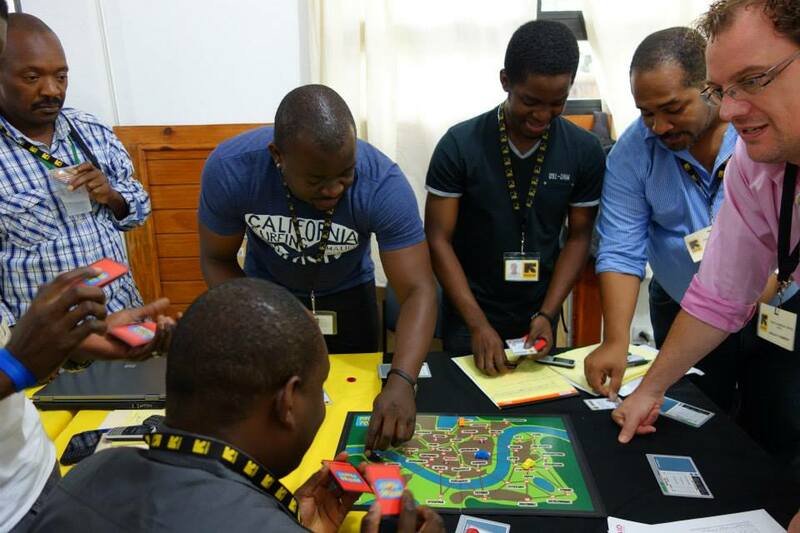 Players are divided into two teams that represent the NGO's managers and their fleet of drivers. Given the limited resources available to NGO's and aid organizations, along with the fast turn around and immediate action required, several organizations ignore vehicular up keep, as well as ignore their driver's advise on the same. MANAGERS: The Managers team plays on a different table, competing to get the most reputation points for their organization. The managers bid for aid missions that give them publicity and reputation points, if completed on "time" and safely. This adds an additional level of stress on the managers to ensure the missions are completed as soon as possible as time is a limited commodity in the game. Additionally, from each mission's perspective time wasted might cost lives for the receipts of the aid. Once a few missions are completed successfully, managers can begin bidding for larger scale projects that get them more visibility, and in relation better resources to work with. DRIVERS: While Managers are playing a game of strategy, their strategies will amount to nothing unless they have a reliable team of Drivers who can complete the missions. 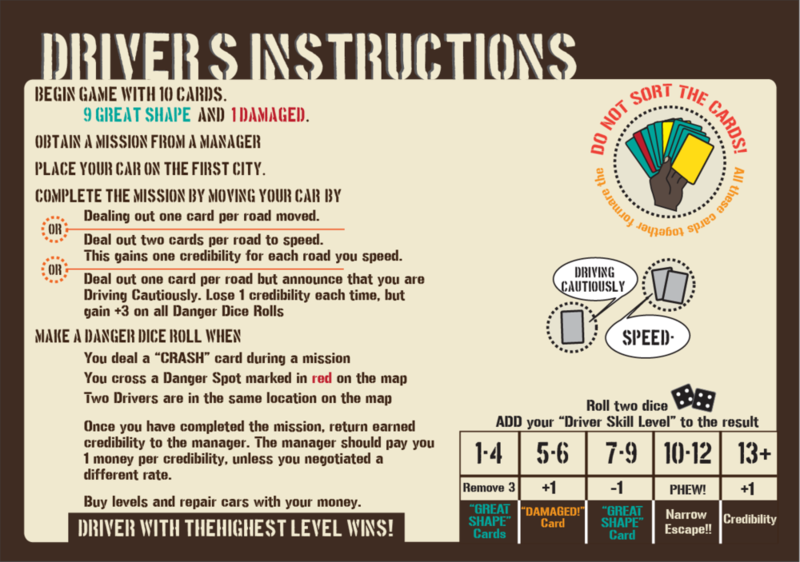 The Drivers play on a separate table with a map of the city on it, allowing them to chart and plan their routes. However, this physical disconnect creates a number of misunderstandings between the Managers and Drivers. Managers want the drivers to complete the missions as fast as possible at the lowest cost possible. The lower the costs and the faster the routes, the higher the risk on both the drivers and the vehicles they drive. Eventually, the Managers keep pushing drivers to take greater risks while their focus is only on the missions, while the Drivers resent their disinterest and feel more and more under appreciated, and keep pushing back on taking any risks, delaying the mission timelines. As a result, both teams begin selective seeing only parts of the larger system that requires both to cooperate, not compete. 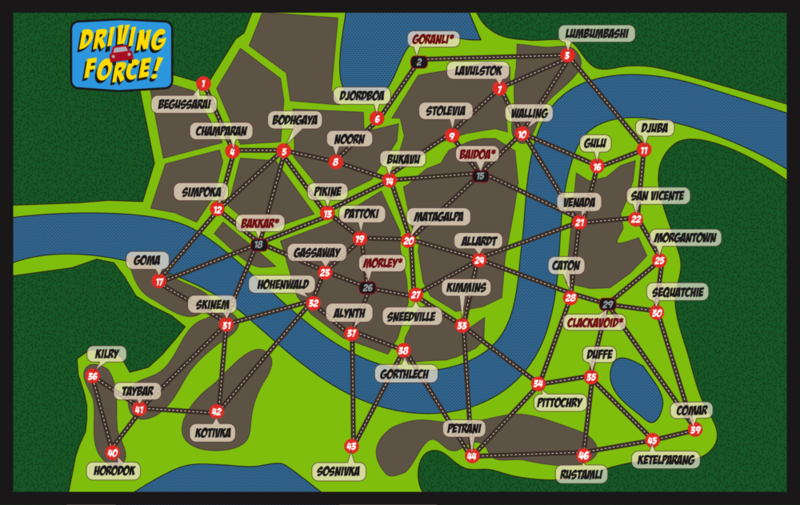 Map of the game world. Delivery Force! is a competitive co-operative game played by groups of 8-10 players. Players are divided into two teams that represent the company's managers and their fleet of drivers. Commercial organizations must make a profit, as a result the focus is on extraneous cost cutting, and speed of delivery. As a result, most organizations ignore vehicular up keep, as well as ignore their driver's advise on the same. 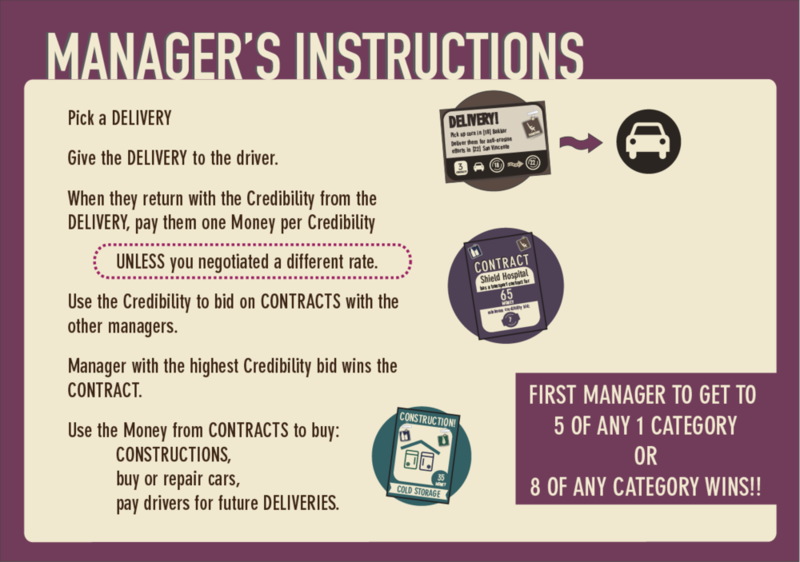 DRIVERS: While Managers are playing a game of strategy, their strategies will amount to nothing unless they have a reliable team of Drivers who can complete the deliveries. The drivers play on a separate table with a map of the city on it, allowing them to chart and plan their routes. However, this physical disconnect creates a number of misunderstandings between the Managers and Drivers. Managers want the drivers to complete the missions as fast as possible at the lowest cost possible. The lower the costs and the faster the routes, the higher the risk on both the drivers and the vehicles they drive. Contact us if you would like to play a session!